Run a block of wood over the wall to remove all high spots. Make sure that all holes are plugged up, especially around edges of posts. Ensure that all power point and light box casings are fitted. 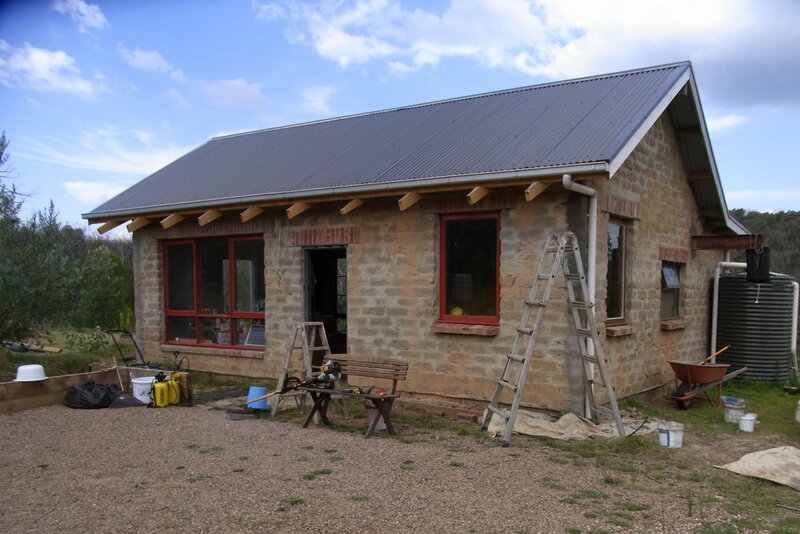 On raw mudbrick, redbrick, strawbale, cinderblock, cement sheeting, or other similar surfaces, we recommend you get our Render Additive, mix it with water (see the bottle for ratios), and spray (or brush) the wall before applying a render. On walls that are in poor conditions, we suggest you use a stronger mix. Apply your render over the wall whilst it's still damp from the Render Additive mixture. You can apply it with a sweeping head brush, a trowel, your hands, or whatever you find is able to hold the render. There are 3 appropriate types of render, all in varying degrees of difficulty. The easiest way is to buy our specially made premixed fine render, which you just add 2 parts water to 5 parts render. If you want to make your own render, we recommend a mix of 3 shovels of Victorian brickie sand, 1 shovel of washed sand, 1 shovel of cement, and 50-100 mL of Render Additive. The third way to make render is difficult, if not for how to mix it, but how to source the materials. River Silt is not the top soil, but the subsoil. It has a low pH (high acidity) which adds to the durability. The cellulose in the fresh cow dung helps with adhesion and reduces cracking. Silt renders are suggested for interior use. If using on the exterior it will need to be stripped and re-coated as part of the maintenance. Using a concrete mixer, add 10 L of water, 2-3 shovels of fresh cow dung, and 1 shovel brickie sand. Mix for 15 minutes, then add 10 shovels of sieved river silt, making a dough like texture. Mix for another 15 minutes, adding up to 15 L of water. A yoghurt viscosity is the ideal end result. This mixture has been the Grimes family recipe since 1956. Different areas have different loam varieties. Some may have higher or lower clay content so you may need to adjust the amount of cow dung added. Before rendering the entire wall, fill the largest holes first. You can fill these with a mixture of render and wall materials, or just a stiff mix of render. If you're adding wall materials to the holes that you're filling, briefly soak them in the Render Additive and water mixture beforehand. The stiff mix of render should be throwable, so if you have a gap between a post and the wall, if you throw a handful of render at it, it should follow the gap up and down. With silt renders, it's best to plug large holes with a cement render as it dries quicker and won't crack or sag. Allow 3 days in summer or 1 week in winter for the excess moisture to leave the deep patches of render. When rendering the entire wall or panel, start at the top of the wall and work your way down. If you can work in manageable sections (post to post, corner to corner, window to window, etc. Scoop up your render, and push it against the wall in an upwards sweeping motion. This should help it better fill all the small holes and cracks in the wall. If you are after a smoother finish on your render, 10-15 minutes after application, lightly go over the wall with a damp sponge to remove excess sand. Unless you are happy with the colour of your render, or have added colour to your render, we recommend you go over the surface with 2 coats of Colourcoat. We have a wide range of colours from traditional mud brick colours, to modern colours, or even eccentric colours. Most plaster paint colours can be matched or approximated in Colourcoat. To apply Colourcoat, first make sure the product is well stirred. As this is a silt-loam paint, it settles in the container and must be stirred before use. We recommend a drill attachment or perforated steel hand stirrer, otherwise you may be there for a while. Because Colourcoat is made of river silt, it does contain small organic impurities. These are not problematic, and can be left in the paint, or skimmed off. Colourcoat must be brushed on, and cannot be rolled or sprayed. The ideal brush to use is a 100 mm lime wash brush as it holds more product and covers a greater area, though lesser brushes can still be used to great affect. The ideal way to apply Colourcoat is in a cross-thatch, motion. This should help throw the paint out and use the weight of the brush to help apply it. Lay off the paint afterwards (brush along the brick course). Grip the brush loosely, primarily with your thumb and index finger. Do not grab it tightly with the handle running across your hand. Start at the top of the wall, working in manageable sections (post to post, corner to corner, window to window, etc. ), doing several brick courses at a time. If you need to stop before you're finished, make sure it's along a brick course or at the edge of a wall, so as to minimise the effect of a lap mark. After the Colourcoat has been applied, we recommend going over the surface with one of our Water Repellents. For external areas that are subject to weathering or are near taps or down pipes, use Silicone Water Repellent. For interior areas, like bathrooms, laundries, or kitchens, use Mudbrick Water Repellent. The application is the same for both, apply 2 coats, wet on wet. This means that you need to do one coat, starting at the top and working your way down. The area that is going to be more susceptible to water should have a more generous coating, whilst the areas likely to get little water can afford to have a thinner coat. For example, if you were to do an open, outdoor wall, with a small eave, you'd do a thin coat under the eave, and start apply more as you go down, with the bottom of the wall receiving the most. After this first coat is done, go back up to the top, and repeat the process whilst the surface is still wet/damp. This may richen the colour temporarily for about a couple of weeks. In some instances, a mudbrick, red brick, or Timbercrete wall may have no render over it and you may not wish to render it. For that, we have Clear Dustproofer. You simply need to dilute it with water up to 25% (depending on how sound the surface is) and apply 1 coat. The above guides for Water Repellents apply to Clear Dustproofer. To affix skirting boards, picture rails, toilet roll holders, light fittings, art work, splash backs, etc., drill into the mortar with a 20 mm masonry drill bit. Dampen the hole, dip the 25 mm diameter by 70 mm length hardwood dowel into Render Additive and hammer into the wall (into the recommended sound mortar) then fix all attachments with a threaded fixing device into the dowels. Note: ensure that there are no gaps left behind splash backs or flat fixtures which could harbour ants et al.